Yo – hey! It is the second day of the year and I head back to the office tomorrow. I have been working on cleaning my home office and basement over the holidays. In the far corner of my basement there has been a rather large box that I have kept sealed for years. The box has moved three times and has sat in this particular corner for at least the last ten years. My mom had packed it up right after I moved out. I knew one of the things in that box was my old Rocket Tubes track. I had fond memories of that toy and wanted to keep it well preserved until I had kids old enough to enjoy it and not immediately destroy it. Today was that day! In the box I found some other real treasures of long ago. 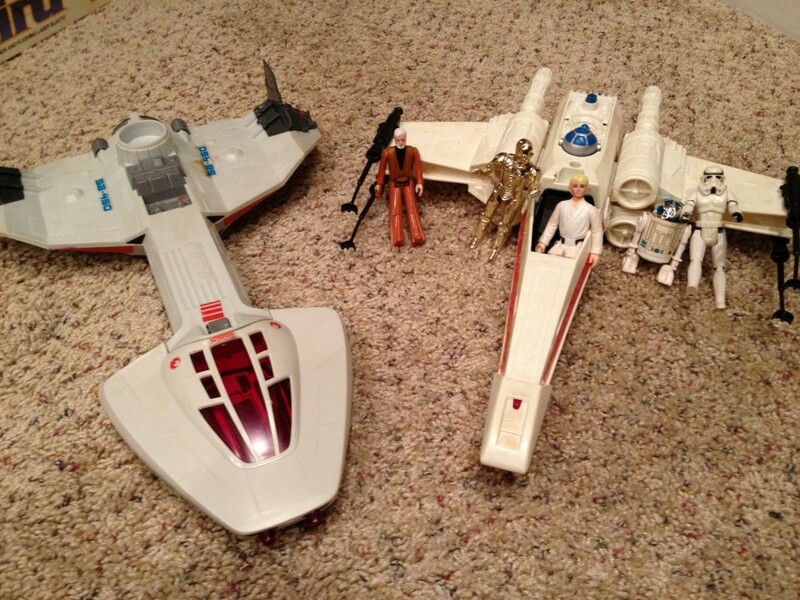 In addition to the Rocket Tubes, I found my old Star Wars X-Wing and action figures! I also found my old Radio Shack morse code practice oscillator, an astronomy kit, a little wood workshop, an electronics kit, and Star Bird toy. My kids weren’t really interested in most of the stuff but did find the Rocket Tubes of ´particular interest. We took it out of the box and set it up. 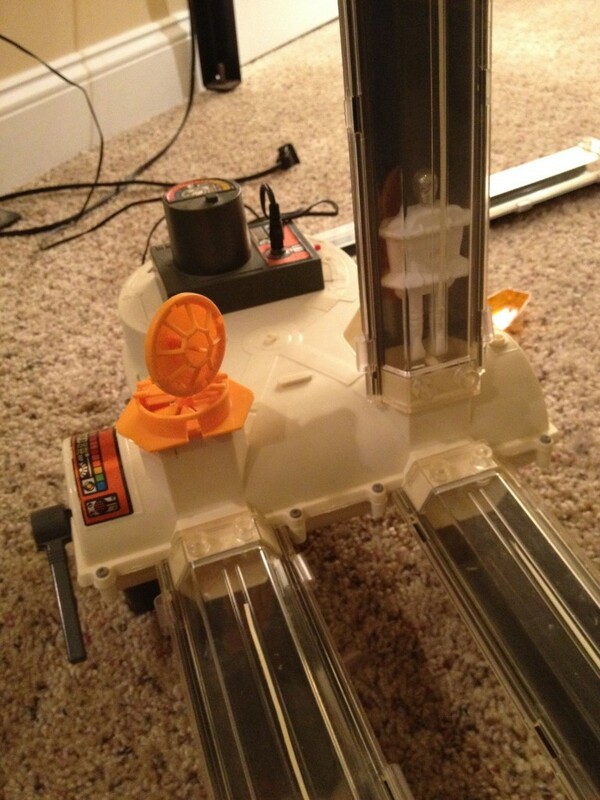 This really was an amazing toy and I am surprised after all of these years it still works. I have never seen a toy like this since. 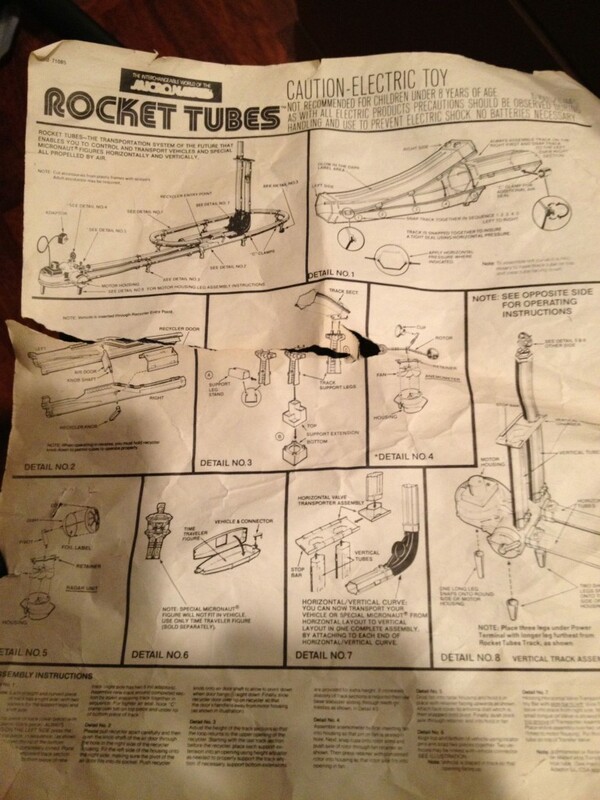 After a little investigation I discovered that the Rocket Tubes came out in 1979 from Mego Micronauts. They were billed as “Rocket Tubes – The Transportation System of the Future.” The set was similar to race tracks of the time only in this case it was little cars and robots that float thru air powered tubes. With the track you could create space elevators or typical racetrack type loops. Very cool indeed! My oldest son was the most interested. It was pretty good entertainment for a couple of hours and a nice trip down memory lane. Oh and I had to play with the StarBird too. Here it is. Now play time is over and time to get back to work! Thank you for your review! I really liked being here. Output is listed at 15vdc 600mA. The power supply I have is a model: 15-06 from Mego Corp part number 71083-800. Radio Shack probably will have one with an equivalent voltage. Hope that helps! Uber cool toy. Works exactly like the pneumatic tubes that send messages back and forth in municipal buildings like courts and DMVs. Found one at a garage sale recently, works like a champ. Very entertaining, almost as much fun as a Crashmobile. Remember them? I never had a Crashmobile but do remember them. Fun stuff! Thanks for stopping by! Next Next post: What is it about a riff?